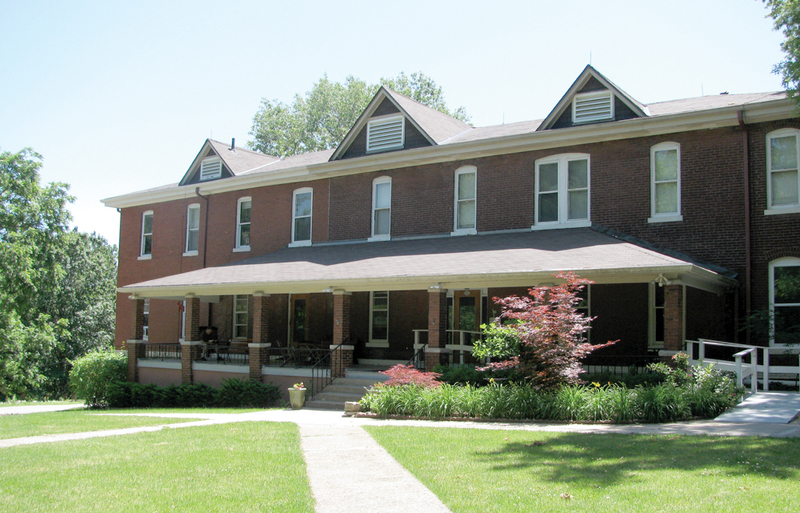 The retreat house was constructed in 1898 as a home for the mentally ill. With a front ramp and elevator, the facility is completely handicap accessible. In today’s rat race, a spiritual retreat may seem like an indulgence but, according to Father Dennis Wait, it can be just the thing to restore inner peace. Father Wait is the spiritual director for Sanctuary of Hope (SOH), an interfaith prayer and retreat center in Kansas City, Kan.
SOH’s 27,000-square-foot facility and 33 acres of beautifully maintained grounds provide space for groups and individuals to reflect and “meet God in their own way,” said Father Wait. And while SOH caters to all faiths, 60 to 70 percent of its visitors are Catholic. Father Wait felt called to establish the center in 1996 during a sabbatical in Minnesota when he was pastor of Our Lady and St. Rose Parish in Kansas City, Kan., struggling to meet the deeper needs of the community. “The Lord said, ‘Dennis, just bring the people to me and I’ll take care of them,’” Father Wait said. He returned from Minnesota fired up about his inspiration, received approval from then-Archbishop James P. Keleher and set out to transform the 100-year-old facility into a prayer and retreat center. The building had traditionally been a place for healing — first as an asylum for the mentally ill, then as a nursing home run by the Sisters of Charity of Leavenworth, and finally as a place for Vietnamese refugees. So it made perfect sense to transform it into a place for spiritual healing. Today, the center contains 22 sleeping rooms for overnight retreats, a fully equipped commercial kitchen and dining room, a chapel, library, youth room with space for 22 cots, and meeting rooms small and large. The property surrounding the building includes wooded trails, a meadow, a water garden and numerous shrines where visitors can meditate and pray. A nearby residence, the House of Peace, provides space for overflow and a more intimate environment for small groups. “God has sent people — professionals who told us what needed to be done,” he said. Water lines had to be replaced, electrical systems brought up to code, walls and woodwork painted and refinished. “We just started at one end — the new end — and moved our way back to the older part,” Father Wait said. The Sisters of Charity added the “new” end in 1946, including the chapel and elevator. The center is a work in progress and still falls short of Father Wait’s vision. Some improvements entail enormous costs, such as replacing the large boiler and the building’s 118 windows. In case the boiler goes out, Father Wait installed a wood-burning stove in the chapel. Besides Father Wait, six live-in residents assist with retreats and help maintain the facility and grounds. The group forms a small faith community. Father Wait considers the living arrangement a blessing. The residents wear different hats, depending on their unique talents. Steve Sullivan manages the kitchen and cooks meals. Jeff Stock, a professional landscaper, designs plantings and oversees landscape maintenance. Some residents are bilingual, a valued skill in the Kansas City, Kan., neighborhood. Anita Martinez, a mother and grandmother, helps with retreats and adds an artistic touch to the facility. She lived alone in North Kansas City before moving to SOH almost five years ago. Visitors learn about SOH from word of mouth. Julie Zimmer learned about the center from one of the volunteers. “I was looking for a retreat center close in, inexpensive and with a Christ-like environment for a group of women in a Bible study I facilitate,” she said. Her group ranged from age 47 to 87. Some stayed two nights; others only one. The experience caught her group by surprise, as it often does with visitors. Zimmer’s experience is exactly what Father Wait had in mind when he established SOH. About 600 people visit SOH each year, but the center can accommodate two- to-three times that amount, Father Wait said. His goal is to book more retreats during the week and to put the center on sound financial footing. “My hope is that we could establish a financial corpus that would take care of it so it’s always used as a place of healing,” he said. In addition to spiritual retreats, SOH provides opportunities for youth groups to log service hours. Students help clean debris and work on landscaping and indoor maintenance projects, such as painting. SOH’s location in inner-city Kansas City, Kan., also provides opportunities for community outreach to the area’s culturally diverse residents. The center taps resources provided by other charities in the area. SOH raises most of its $225,000-plus operating budget from two fundraisers. “Run the Good Race” is a combined cross-country and road race to be held on June 16. It winds through the SOH grounds and neighborhood and draws hundreds of participants. The event raises about $10,000 after expenses, said Bill Page, race coordinator. The second major fundraiser, scheduled for Nov. 10, is the Hope Benefit Dinner, Dance and Auction. SOH appreciates donations of cash, new items or gift certificates to be auctioned at the event.